Enza Parker is a thirty one year old who works for her father flipping houses in North Carolina. When her grandmother passes away, she leaves Enza her house in Louisiana. Enza travels to Louisiana to flip and sell the house, but she doesn’t expect to meet Jack Mayronne. 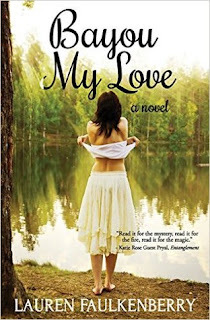 Bayou My Love introduces the reader to the real Louisiana and the romance and intrigue that the bayou has to offer. Before I even finished the first chapter, I knew I was going to love this story. The way Lauren describes her characters… it was perfect! She described the characters with wonderful detail, but not too much detail. I appreciated that because I always love to use my imagination and make the characters my own. Enza and Jack are authentic characters and easy to relate to. I adored reading more about them and found myself unable to put the book down. This story was about much more than just a simple romance. There was mystery, suspense, voodoo, drama, and some steamy love scenes! No cliché love story here! I wasn’t ever able to guess what was going to happen next and I loved that. All in all, Lauren’s writing is exquisitely smooth and easy to read. I loved the story she told and the characters she created in Bayou My Love. I would highly recommend this novel to any readers who enjoy fiction novels that include a splash of mystery and love.